ScreenACT Project Pod has 24 places available for the first phase in helping Canberra based digital content developers, with entries closing 10.00am 29th March 2010. The project is designed along similar lines to the InnovationACT annual event run by the ANU. There is a nine page "Project Pod: Application Form and Guidelines" avialable, as well as Key Dates and FAQs about the project. ScreenACT offers support with the general aim of helping to develop the local screen industry, thereby enhancing the ACT production industry’s capabilities and employment opportunities. Project Pod is a professional and project development opportunity that aims to build capability in screen project development, increase networks, and support a group of targeted projects through to a market-­‐ready stage. The program has four main phases, which start with broad learning goals, then narrow down, focussing on key teams to help them refine their projects to the point that they are ready to take to market. As part of this, several top projects will receive extra funding. the film, video production, TV and digital media industries. projects that are intended to result in commercial or business focused outcomes. applicants who have started their careers and can demonstrate professional experience. participants who show a commitment to the six-­‐month process. projects intended for production and post production in the ACT and Capital Region. applications that are professional in their presentation, thought and execution. Phase Four – ScreenACT Grants allocated to as many as four selected projects Selection for the Project Pod is competitive. Phase One will include up to 24 participants. Phases Two through Four will have up to ten participants. Project Pod will be led by a number of different providers, and tailored to the needs of the individual participants based on their project’s format and genre. Phase Four delivered by ScreenACT. All participants for all phases to be selected by an industry panel, with ScreenACT acting as secretariat, and with the sign-­‐off of the CEO of Canberra Business Council on final participants and funding. Phase One costs participants $600 for the two workshops. The first workshop is over four days, and the second over two. Phases Two through Four have no participation cost. The program covers narrative and story, introduction to development practice, pitching and presentation skills, introduction to producing, networking with industry professionals and Screen Australia representatives, and one-­‐on-­‐one professional development assistance on a project basis. Feature films, television drama series, mini-­‐series, telemovies, broadcast length documentary, television documentary series, reality TV series and digital media projects. Applicants must have started their careers and be able to demonstrate some degree of professional experience. Applicants must be Australian citizens or permanent residents of Australia, and be 18 years old or older. Applicants can be individuals or up to a team of two. The team leader must attend all sessions. The second team member is expected to attend all sessions, however there is some flexibility on this issue. Greetings from the Screen Australia road show. A government review of support for the screen production industry, including the Producer Offset, is due out today. But at the same time Screen Australia is seeking input on the future of the film industry. CEO Ruth Harley is speaking at a road show around Australia and today is Canberra's turn. The meeting is at the CSIRO Discovery Theatre, with about 60 people present. What strikes me is that Screen Australia talks about the feature film and TV industry. However, these are now dwarfed by the computer games industry. The Apple iPod has changed the music industry and the iPad may be about to do the same to the TV industry. However, the way Screen Australia works does not seem to have changed since cameras were hand cranked. They seem to be trying to help set up an obsolete analogue last century industry for Australia, rather than a digital one for the future. Mid range features ($M10-30 ) lack domestic funding. This is an effect of the government offset, which helps both small and large features, but not mid-range. Longer documentary series are doing well, but the Screen Australia process is complex for one off documentaries. Liquidation of SPV has complex legislative issues. Providing a grant has tax issues. SAC test is currently holistic and has no detailed points score type process which leaves producers uncertain as to what might rate well. Details of previous applications are secret due to tax law. "Reality" TV is uncertain as to if it qualifies as "documentary". Low budget features may not be helped by lowering the limits on the current tax offsets as this requires a "theatrical release". 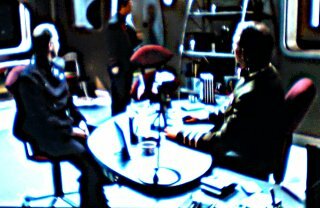 Low budget films might use other distribution, such as online digital, which does not qualify as "theatrical". At question time I asked if Screen Australia were addressing digital media. They responded they have initiatives in this area. However, I suggested they need to change their mindset and terminology. Digital distribution is seen as "alternative" by Screen Australia, and theatre distribution normal. I suggest this needed to be reversed. Young consumers see the iPhone as normal and going to a "cinema" as unusual. Another attendee asked about support for the gaming industry and Screen Australia replied this was a matter of government policy and that representations should be made direct to the government. I got the impression that Screen Australia did not want to address the gaming industry without additional resources. In my view, as the gaming industry is now larger than the film industry, at least half Screen Australia's resources and the government funding, should be devoted to it and digital media. Screen Australia appears to be stuck in last century technology and unable, or unwilling to change. The government should therefore abolish Screen Australia and set up a new digital entertainment body, which addresses digital media as a priority and also the legacy film industry as a secondary priority. The NSW Writers' Centre was the venue for the filmmakers of Sydney to assemble for Christmas drinks last Friday night. Somehow I received an invitation as one of the Twiteraity. The centre is located in the grounds of the former Rozelle Hospital, is a sandstone building. There are beautiful grounds with flowering trees, a veranda perfect for drinks on a warm summer's night and book lined rooms. Part of the site is occupied by the Sydney College of the Arts. It was easy to tell who were the budding actors: the younger more stylishly dressed with business cards ready at hand (one I met was a part time property speculator, who having finished their NIDA course had one a scholarship to the NY Actors School at LA). It was more difficult to tell the editors from directors and writers. People would come up with a mindful of ham and a glass or Rose and say "are you a director or editor"? It was too difficult to explain I was a computer programmer, so I settled for saying "Writer: my latest book was released last week at an event with the Prime Minister", which stuck the right tone. After confessing to doing web design I was asked for advice by a media PR person. I confused them by recommending they get a blog, as their target audience are journalists who have no interest in pretty layout,: they just want text. I had to explain that I did useful web sites, designed to communicate information, unlike those used in the creative industries (as an example the style over substance web site of the Australian Directors Guild with markup errors, accessibility problems and incrorrectly sized images). Only later did I realise ADG was one of the hosts of the party (it would be very difficult to work this out from their web site, or discover anything at all from their web site). As well as ADG, also hosting were Australian Guild of Screen Composers (AGSC), Australian Screen Editors Guild (ASE), Australian Screen Sound Guild (ASSG) and Women in Film and Television NSW (WIFT) and the all have much better web sites than ADG. Recently a friend in the mass media asked for advice on preparing documents for presentation to executive management. They asked if they should use Powerpoint or Microsoft word. But perhaps something like the Celtx free screenwriting software is needed. This might also be useful for conference presentations and e-learning. Celtx is designed for writing plays for stage, screenplays for movies and TV, AV scripts and radio plays. It allows setting out who says what and what is seen and heard. It also allows the creation of an animated storyboard, which is used to give an idea of that the final production will be like. This is conceptually similar to an animated Powerpoint presentation: the software steps through still visuals with text and audio explaining what is happening. Celtx has versioning and collaboration features using a central server, conceptually similar to the Integrated Content Environment (ICE) courseware tool. A seminar or lecture partly involves giving a performance, and so it might be interesting to consider how the techniques used for live performances might be applied to academia and education. E-learning can include audio, animation or video. But much of the audiovisual material produced for education has low production values and looks clumsy when compared to professional multimedia the students will have seen. This is partly due to the limited funds and time available for producing education content. But it may also be because educators are not provided with tools or training needed for audio-visual production (I did a course at TAFE to make education videos). Perhaps tools like Celtx could be used and integrated into other e-learning tools. After reviewing the e-learning system in the seat of a long Malaysian Airlines flight I decided to watch a movie. Outsourced is a romantic comedy about an American call center manager who is sent to India to train staff in the outsourced call center. He tells the staff to claim to be from "Chic-a-go". In the end he comes to terms with India after some lessons in life and the world beyond the USA. This is not a documentary and you would learn as much about call center operations from this as you would about e-mail from watching "You've Got Mail". The Indian streets shown looked too clean and almost deserted. The female romantic lead was just a bit too clever and willing to explain the world outside the USA to the American. But it was good fun and might be useful education for those who have not been outside North America. is grimier than previous depictions, with the Bennett sisters having to trudge through muddy fields to reach stately homes. I had the strange feeling I was actually seeing what a screen adaption of J. R. R. Tolkien's Lord of the Rings should have looked like. Darcy and Elizabeth walk around the ground of the fictional Pemberley. This is actually the Gardens of Stourhead with its Temple of Apollo and Palladian Bridge. Stourhead is at Warminster, about 100 km from Oxford, where Tolkien worked. Stourhead and Blenheim Palace , just outsiode Oxford, have grounds by English Landscape architect, Capability Brown. If middle earth was set in a real place, it may well look like Brown's landscape. Taking a break from designing a flexible learning center, I decided to watch a TV sci-fi film. I was amused to find the curved desks I was looking at for the learning center were considered sufficiently hi-tech to be used in the film on a space station. 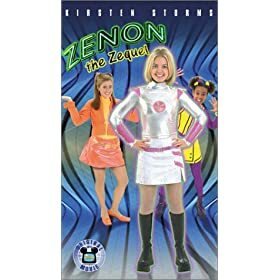 If you look at the space station commander's office at about one hour into Zenon: the Zequel (Disney 2001), you will see it is very similar to the "Jelly Bean" desks used at RMIT Library in Melbourne. 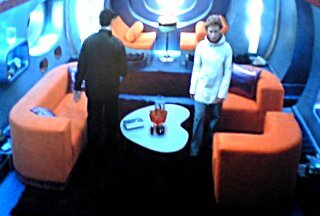 Also the coffee table in Zenon's family room on the space station seems to be from the same furniture range. The film was made in New Zealand, and if someone could ask set decorator Kirsty Griffin, Props Buyer Christine Mangen or Art Department Coordinator Anna Graves where they got the desks, that would be useful.